What to look for when purchasing a blender? I currently don't have a blender after purchasing my own home and am looking to get one for making smoothies primarily, but also for pureeing for soups, etc. I had a smoothie maker that I won as a prize; it was very obviously a cheap unit. It barely handled frozen fruit and yogurt. Ice cream and frozen fruit burned up the motor. I am aware of the extreme "Home Improvement"-style "Binford-3000" Blendtec blenders (also as proposed in this question) but they are extremely expensive and I don't plan on incorporating cell phones or garden rakes into my smoothies. 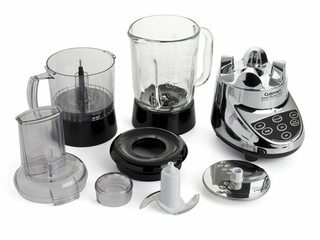 What should I look for to get a quality blender? I don't want to purchase an inexpensive one three or four times in the next few years. I'd prefer one that will last a long time and prove to be a good kitchen tool. 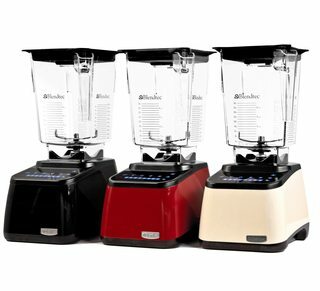 In shopping for blenders, it seems that most seem to be between $30 and $150. Obviously there are some questionably cheap ones and many that exceed that range. So for the purposes of this question, assume that range to be the budget. Look for a strong motor and thick blades. If the blades are thin, they're likely to warp over time. The motor needs to be able to spin those blades through the liquid. Look for a thick glass container. The plastic ones are unlikely to deal with the heat of things like soups and sauces being dumped in. Check the gasket between the glass container and the piece that attaches the blades. A thin, flimsy gasket is likely to start leaking before a thicker, softer gasket. Look at the number of teeth on the connection from the motor to the blade. The more teeth, the greater the surface area being used to distribute the power to the blade mechanism and is less likely to wear out. Overall, as with many things, one of the quickest ways to tell a good one is to weigh them both. The heavier item is better. No one pays for shipping extra weight unless it's there for a good reason. In addition to the points mentioned by the others, you also want to have the base tapered so that it expands upward. The smaller the base the better contact the blades will have with the food. If you're looking for something with a long lifespan, then I'd also consider spare parts, and how long you expect the model to be around. For smoothies you should look for something with plenty of room beside the blades. The blender I have at home is similar to this picture. The spinning blades are in a well which makes it difficult for frozen material to get under. For juices and soups this blender is fine but whenever I make smoothies it reaches a point where the blades are spinning in an empty cavity. Contrast this to a state of the art blender like Blendtec. The bottom is very wide as well as the blade. More than enough room for any sort of thick liquid to get down there and thoroughly blended. When shopping around for blenders, try to be aware of the space available for the liquid to move. The clutches in many of the ones I have seen are made of plastic and can very easily wear out fast if they slip or aren't engaged properly before power is applied. If the chopper bowl is too small then everything will be liquefied instantly because the chopped pieces don't have enough space to move out of the way before teh blade hits them again. I got a philips HR1611 recently and it's totally impossible to chop anything, everything gets pulverised. This makes the chopper attachment more or less pointless because you can always liquefy things with the stick attachment. Look for something well-made with a 5 prong blade. Not the answer you're looking for? Browse other questions tagged shopping blender equipment or ask your own question. How important is RPM in a blender? What to look for when buying muffin tins? What to look for in a hand mixer for occasional bread dough kneading? Slowing motor and electric smoke coming from Magic Bullet blender? Blender part in dishwasher, poisonous?